It's nearing the end of the summer, and naturally my thoughts turn to pickles. The farmers' markets are flush with tiny eggplants, okra, cucumbers, and I'm already envisioning myself come January, plucking them with my fingers out of a mason jar of brine. Full disclosure: I am talking about refrigerator pickles here. I am ashamed to say that, although I like to imagine myself as One Who Puts Up, I have never learned to can, and haven't yet been brave enough to try fermenting my own kosher dills and sauerkraut. I know, I know ... I am an embarrassment. A fraud. I deserve no claim to culinary triumph. But, I ask you, how is a girl with approximately 0.0005 of an acre of arable rooftop garden supposed to grow enough to put up for the winter? And where, pray tell, is she to find an Agway that sells Ball jars, jar racks, and pectin? "Pish posh," the reader may say, knowing full well that the author's mother is an expert canner, and that her father actually owns a sauerkraut/pickle crock. "But," I protest, "he uses the crock for decoration, and resists all my efforts to put it to its intended use." Don't toy with my emotions, please. Until some pickling knight in shining armor arrives at my doorstep bearing canning supplies, a crock, and some expertise, I am resigned to refrigerator pickles. 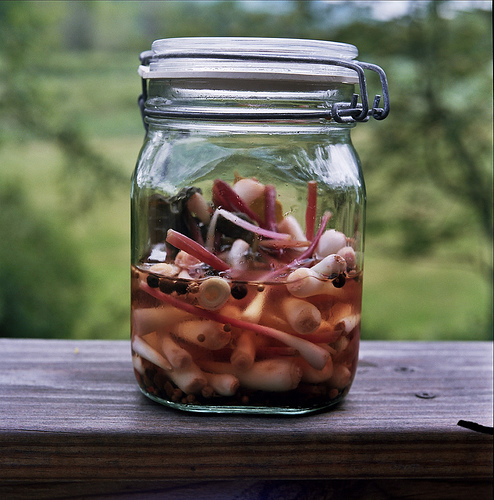 The photo above is of some ramps I pickled this spring that we've been using to make pickled ramp martinis, a la Dan Barber. Below, you'll find a recipe for this most delicious beverage, as well as two recipes for quick refrigerator dills and spicy pickled eggplant. Enjoy. This may not look like much to you ... but to us, it is a wonder. In a nearly-psychedelic trance of cleaning enthusiasm yesterday, Carl and I did some major damage control on the refrigerator. We emptied the shelves, one by one, and gave all the surfaces a good cleaning. Condiments dating back to 2004 were discarded, rock-hard cheeses were tossed. Nothing was returned to the fridge unless it was clearly identifiable, totally edible, of relatively recent vintage, and labeled with an approximate date of opening. This was a serious endeavor. The only items that were not labeled with a date were leftovers that would be eaten in the next few days (i.e., yam fries, pozole, hummus, middle shelf), and fundamentals or condiments that we know will be consumed before they go bad (i.e., yogurt and beer, bottom shelf; maple syrup and Mama's jams, top shelf). This clean fridge thing me feel like a whole new woman. I highly recommend it to you all. 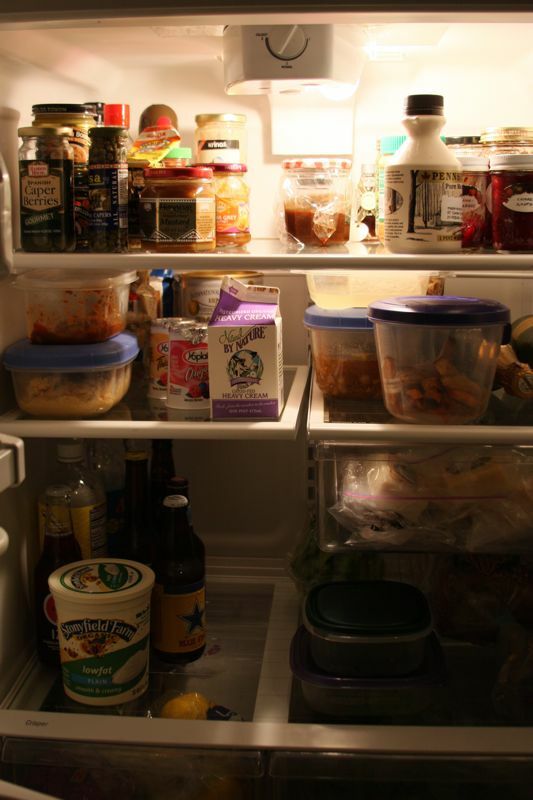 And while you're at it, send us a photo of your fridge! It's hardly the Shoot! The Blog Hot Photo Assistant Contest, but it'll give me something with which to entertain myself. People often say that bacon is the single food most likely to cause vegetarians to fall off the wagon. Sure, I know some people who have slipped for curried chicken salad, and others for mom's meatballs. But bacon is the evil temptress of meat products, the Angelina Jolie of straight women's fantasies. Don't believe me? See the Jews For Bacon website, and a recent Chowhound post which begins, "I�m vegetarian, except I like to eat bacon." Dear readers, I am thrilled to be writing this post about something miraculous -- a dish that will have even committed meat-eaters thinking seriously about going meat-free. Or at least thinking about switching to an all-kale diet. Behold the New York Times' Raw Lacinato Kale Salad, which is likely to do to carnivores what bacon does to vegetarians. Since the recipe was printed in October of 2007, Carl and I have probably made it at least once a week, sometimes twice. We served it to my skeptical brother and sister-in-law, who are now converts. We eat this stuff religiously. I've made a few modifications to the recipe, below, but at this point I've made the dish so many times that the recipe is irrelevant. I could do it in my sleep. Whether you're a vegetarian, omnivore, or pizzatarian, I insist you try this recipe. You will love it. And if you don't, please file a complaint (in triplicate, of course) with What We Ate, and the authors will be sure to scoff at you in their next post. What with our long absence from the interweb, you may think we have been subsisting on water and dry crackers for the past two years. To the contrary, my friends. I've just been too busy to write - practicing law full-time while teaching on the side can do that to you. But given that my new career depends on my ability to put the proverbial pen to paper and produce words of insight, I am training myself to exercise my writing muscles daily ... even if the subject is tortes rather than torts. Unfortunately for you, the reader, we actually enjoyed some mighty good chow during our hiatus, though I have neither the memory nor the time to fill you in on the details. But if there is one lesson that Carl and I learned during this time that we can share with [what remains of] our readership, it is this: We heart Marigold Kitchen. We heart Michael, we heart Brett, we heart all the staff. We heart the food, the ambiance, and the bathroom. We heart them with all our heart. The folks there are miracle workers and deserve some Nobel Prize for improving the world through food. Which is why we're so excited about the public announcement of Zahav, the new restaurant Michael Solomonov and Steve Cook are opening sometime early next spring. The theme? Israeli street food. The website-in-progress? So charming, I want to give it a hug. You can follow Zahav's progress at the Philadelphia Inquirer link above, courtesy of Michael Klein.